Here are our tips for creating the perfect outdoor conversation seating area. Long summer nights beckon us to linger outside for hours on end. Making sure there is stylish outdoor conversation seating arrangements outside help to keep you and your friends and family comfortable all night long is a necessity. 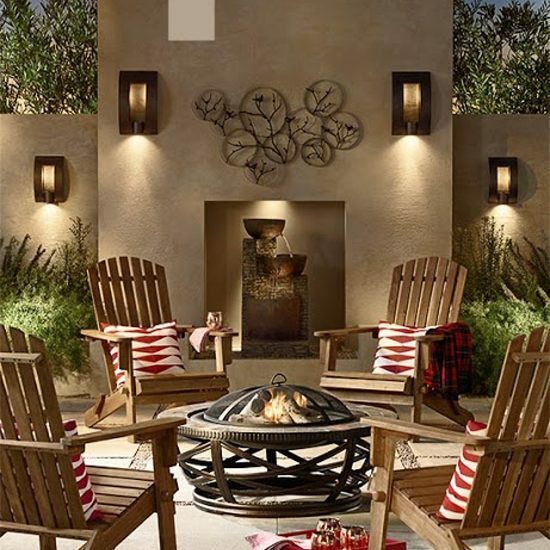 It takes many elements to create the ultimate outdoor space – from furniture to lighting to home decor pieces. There are many elements that need come together to create the perfect conversation area. You’ll want to consider including furniture, accessories, lighting and decor accents. The combination of all of these elements helps create an ideal seating layout to enjoy summer all night and all season long. For example, in the scene above, beautiful rustic yet streamlined pieces come together seamlessly and work beautifully with one another. The look is unified by the use of rustic looking wood and metal finishes. The open space of the patio offers the perfect opportunity for a round, circular seating arrangement with a wrought iron fire pit and Adirondack style chairs. This arrangement allows your family and guests to see one another and easily engage in conversation. In addition to the outdoor seating, the scene makes great use of accessories like outdoor accent pillows and a serving tray help to make the space feel as cared for and meticulously designed as any interior room in your home. You can easily recreate this in your own backyard. For starters, look for furniture that you can easily move and arrange as needed. Modular seating sets offer great flexibility and can often be combined in different ways. The same goes for individual seating chairs like the Adirondack chairs pictured above. Stackable chairs are also a nice option. You can pull them out when needed for a party, then stack them up and store them away when they are not needed. A second point is to look for natural wood finishes that are a timeless and durable. They will not only blend with just about any decorating style, but they are also easy to care for and will stand up to the elements. Same goes for any outdoor pillows or rugs you might be using. Make sure they are in a sun and weather resistant fabric. The ultimate addition to any outdoor space to make it feel the most like an intimate interior room is the addition of hardwired outdoor lighting. 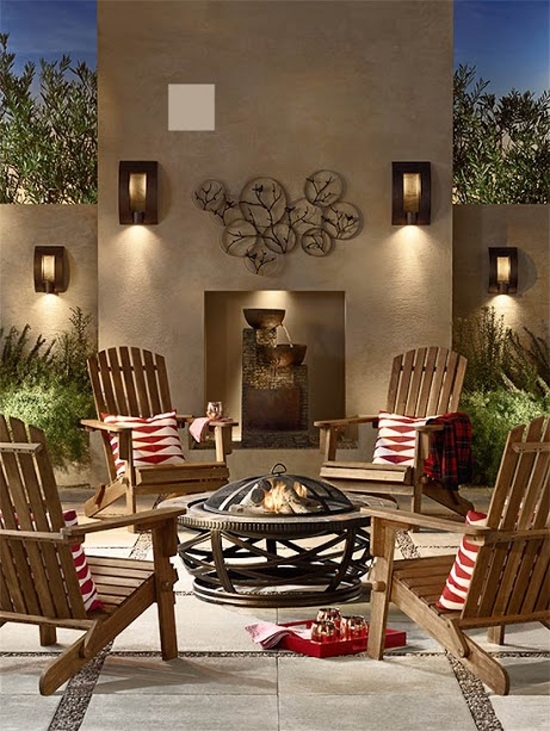 In this scene, slate and bronze outdoor sconces are contemporary but not cold. The modern lines and weathered finish mean the outdoor lights will age beautifully and illuminate your conversations long into the night.